Schüco was established in 1951 and today they are offering partners, architects, and contractors the most advanced window, door, and facade technologies. Schüco has 12,000 partners in more than 80 countries, with 4750 employees. 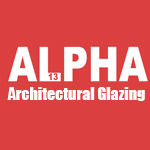 Alpha13 is a selected Schüco partner, which means that highly qualified engineers from Schüco support us with technical advice and training. This close collaboration enables us to gather a lot of experience and to continuously improve our production and help our business partners. Schüco’s advanced window systems have the industry’s best thermal insulation values. In addition to this, the window’s aesthetics and ease of use gives a positive surprise to all our customers. Based on your individual requirements, we can manufacture and deliver windows from Schüco with aluminium profiles. Schüco Entrance Doors, Folding and Sliding Doors. By choosing Alpha13 as the supplier, you will not only get a high-quality Schüco product, but also the opportunity to choose from various design and colour options. that fits all your requirements and dreams, in aluminium . All our door systems can be produced with multiple opening combinations and security levels.